Marshalls Find~ $39 Steve Madden Wedges! Another great find from last week are these cutie beaututies for $39 @ Marshalls! 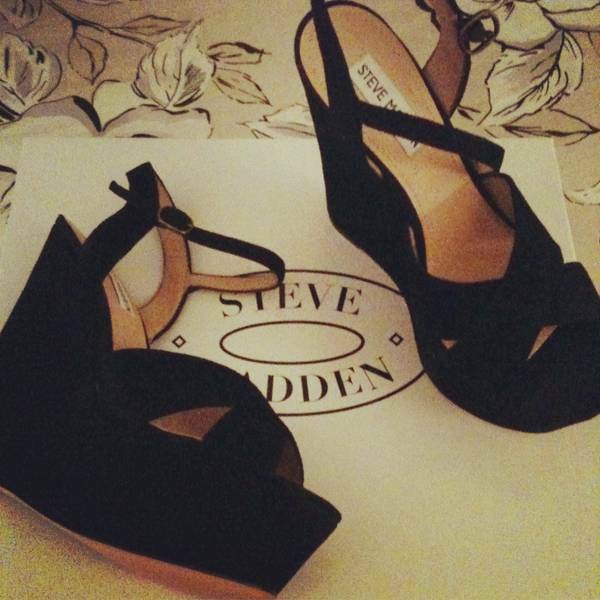 I can’t wait until the weather gets warmer so I can rock these fabulous suede wedges! They definitely will be my go to sandals! They can go with just about anything…dresses, skirts, shorts, jeans! Cute cute cutre! Great find! Cant wait to see u style them! Love,Love,Love the Jacket i’m kicking lsmeyf for missing it when i checked out the dkny stuff at Lane Bryant. You look great, i love those boots too. Are they ankle boots or do they go up higher? i’m a little obsessed with finding a knee high boot. Girl, that hair is the new hotness!! I aeadrly told you that but I’m saying it again.You know I wanna get into your fur collection *side eye* LOL!Prissy! I swear we just like all the same things. I just got a package in the mail from ASOS with a pair of green flared trousers. LOL!